N.T. 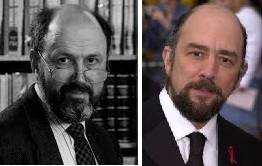 Wright and … Richard Schiff | Amazing Lookalike! On the left is N.T. Wright, Research Professor of New Testament and Early Christianity at St Mary’s College, St Andrews and former Bishop of Durham. On the right is Richard Schiff, who played Toby Ziegler on The West Wing. This one was from another reader’s suggestion. But we take our hats off to your spotting of Wright’s Doppelgänger more than a decade ago.